and see what we are up to. Welcome to the world of the Solid Model. While most of the Golden Age modelers cut their teeth, and the odd finger, on Solid models - and most vendors relied on their steady sales - the Solid model has all but disappeared from the mix of today's multi-media of modeling. I believe that this is due to a couple of things: one, the fear that we no longer have the skill to do a decent job, and two, that plans for these models are difficult to find. More on that later... Of course there are still those out there scratch building/carving museum quality models of materials that, unlike plastic, will last longer than the museum they are housed in. 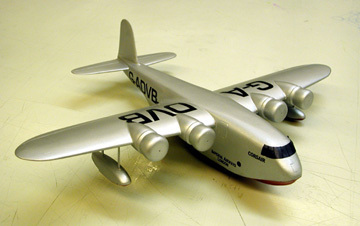 Though these models give awesome inspiration, it is the 5¢ & 10¢ models sold by Comet, Hawk, Maircraft and many others that have me so intrigued, and have given me hours of pleasure. If just having fun isn't motivation enough, carving Solids is actually good for you! Not only is it a great stress relief between important projects, but you may even learn a thing or two. Carving a prop is nothing to a boy who just finished carving a Spitfire. You're bound to pick up a couple of tricks about struts and wires after putting together a Solid D-7, Camel, or Spad. These low stress models use the same jigging techniques as our less forgiving Stick & Tissue friends. Mistakes here rarely end in tragedy. With this web-page I hope to introduce the young crowd, those (like myself) born after the Second World War, to this fascinating hobby. I will be presenting How-to manuals, a variety of working drawings/plans from magazines and kits, and of course some of the history and documents relating to the US Navy ID Models. Two, to foster the active pursuit of this fun little hobby through the sharing of information, ideas and history to and from this web site. Relative to their flying cousins, there has been little interest placed on preserving and encouraging this form of the hobby. There are no FAC, SAM or NFFS organizations sanctioning competitions, and exceedingly few modern producers of similar kits. The strongest support for these kits (other than the much appreciated plans placed in the odd FAC newsletter) have been the kit collectors, and their organization KAPA, Kits And Plans Antiquitious. That this group has been preserving these kits is a blessing, but what is still missing is a place where people can go to look at these documents, and if they wish, obtain copies of them for their own personal use, whether it be to simply appreciate the plans as illustrative art, or to go all the way and build models from the drawings. As you know, I have a nice little collection of magazines, and documents from the US Navy, but I have very few copies of kit plans. I do not need originals, but if any of you would like to share your plans with others, I'd love to hear from you. Many of these kit plans were much more beautiful than their flying cousins. Even for those not inclined to build the model, I know that there are many plan historians and enthusiasts who would love to be able to look at them. If you know of someone not hooked up to the internet, please let them know of this site's goals. I know that many will appreciate your generosity. With your help, much of this history can be preserved and shared to all who would wish to give it a go. WANTED: copies of KIT plans of the '30s & '40s. 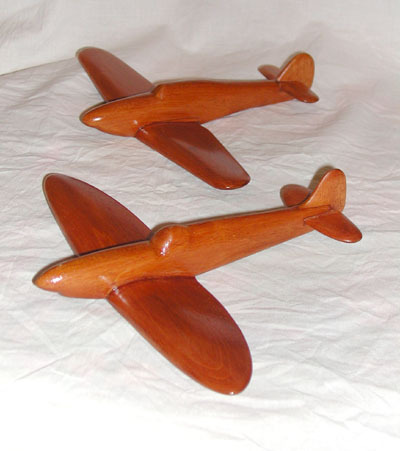 The following are a nice collection of articles describing the process involved in carving a model. The most valuable are the US Navy Bureau of Aeronautics instructions. The one page Procedure Chart for Building Scale Model Aircraft is a gem. If you have one reference, this would be it. 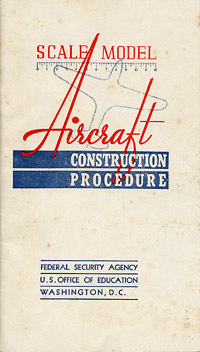 The Scale Model Aircraft Construction Procedure Manual contains the same visual instructions with additional textual info. A great little booklet. Another nice how to of a similar vintage is this nice little treatise on pin pointing the major detail lines before the model is carved. This will go a long way in helping you determine exactly where those elements such as windows and hatches are supposed to go. This is a great beginning. You now have all the info needed to complete any of the Identification Models and many of the simple 10¢ models offered by all the manufacturers. From this point, you're on your own :-) Not really of course, but there is more to those museum masterpieces than can be described by yours truly. Many of the Solids found in my Archives have instructions, and joining the fine group of guys at Solid Model Memories will help you continue on your way. 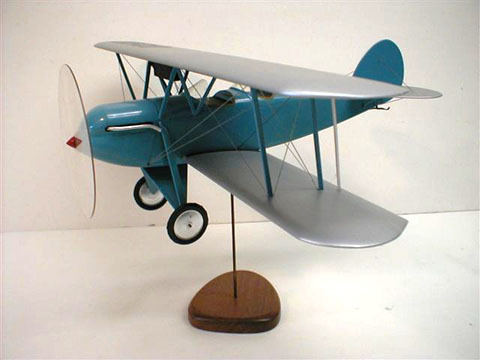 It seems that each model manufacturer had at least two product lines: the built-up, or flying models, and the Solids. In the early days, creating a recognizable aircraft from these kits would have been daunting at best. Included within the kit box was often little more than a block of wood for the fuselage, a plank for the wing, and a thinner board for the tail, wheels, and other details, and a rudimentary drawing with perhaps two cross section details from which to base your carving. In time the plans became more sophisticated, and cast accessories such as engines and wheel were available. By the 1950s, kits such as the famed Strombecker line came nearly completely formed, with only gluing, light sanding, and painting being left for the builder. This is the area in which I need the most help. The following are copies gleaned from the odd Flying Aces Club (FAC), and Kits And Plans Antiquitious (KAPA) newsletters. With luck, these will only be temporary. I would love to get a hold of clean photocopies or high quality scans of ANY kit plan for inclusion on this site. Just the same, I'd love to get a hold of any quality of copy. A poor example is better than having the plan lost to history. Whether the plan is a pristine original, or a copy of a copy of a copy, I'd love to hear from you. Every plan that I receive will be posted for the enjoyment of all interested modelers. 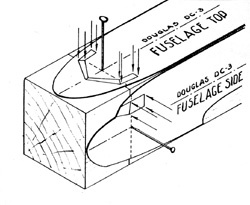 Probably the greatest impetus to build Solid models was the American need for wood Identification Models. The scheme was for the US Navy Bureau of Aeronautics to present a series of plans and instructions to schoolchildren with the goal of 500,000 models to be built for training purposes. The job to create the plans was given to the Comet Model Co. December 9, 1941, a matter of hours after the attack on Pearl Harbour. This group of models represented a most comprehensive catalogue (if not most accurate) of aircraft to that point in history. Today, they make the perfect starting point for fledgling Solid modelers. Laying out and carving a closed cockpit monoplane fighter is easy (honest.) 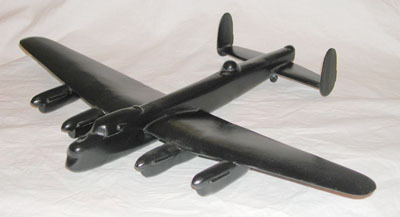 It begins to get difficult when details such as panel lines, cockpit glazing, propellers and landing gear are added. The ID models were essentially form studies. The extraneous details were in fact discouraged as unnecessary for the task of type identification training. The following link will direct you to a nice collection of plans from which you can begin your carving pleasure. 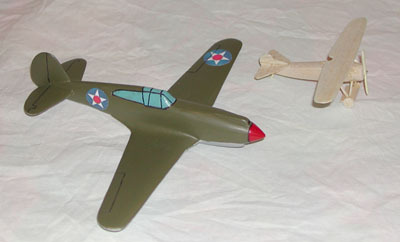 Solid models were featured prominently alongside the flying models in the magazines of the day. The Old Time Model Airplane Magazine has been featuring Solids from Flying Aces, Air Trails, and Model Airplane News since day one, many with very informative accompanying instructions. Soon I hope to have a page dedicated to linking directly to the solids from my magazine, plus a few extra, just for good measure. For now I will simply point you towards my archives page. There have been many folks helping me on my way with Solids, I will list a few now with more to come. Jim Alaback for his pioneering work with KAPA and his writings on the subject, critical for the preservation of their history. Steve Remington of CollectAir and the Friend or Foe? Museum for his informative website (see particularly the Friend or Foe? and Vintage Kits sections) and personal help. Raymond Bennett of Solid Model Memories for his great website, and for his work fostering a Solid web community. Last but never least, the Designers of both the 1:1 and scale aircraft.